Kakteen Orch. Rundschau 8: 51 (-54), figs. 1983 "mairanensis"
Origin and Habitat: Mairana, Florida, Santa Cruz, Bolivia. Altitude: 1400 metres above sea level. 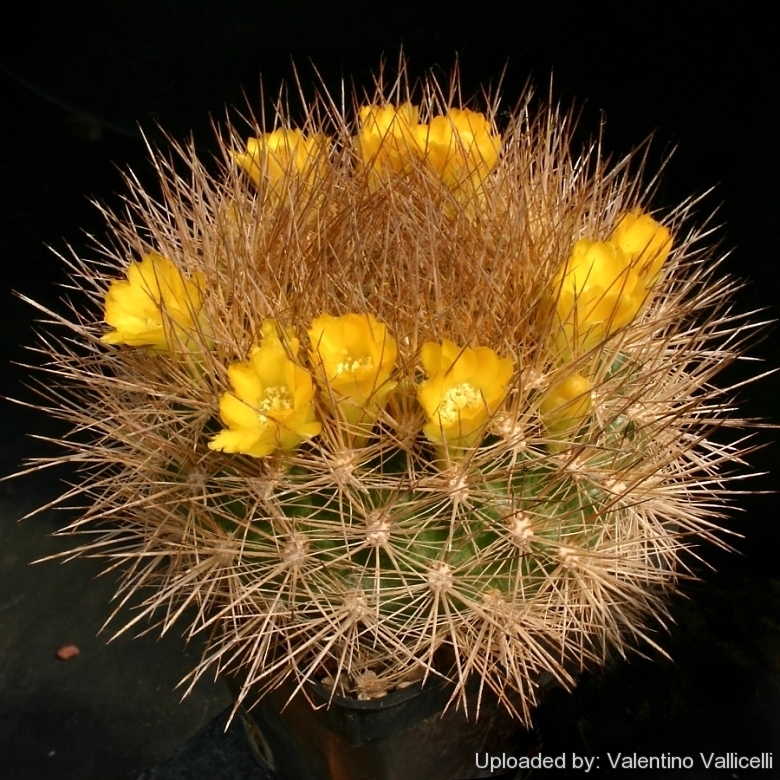 Description: Rebutia neocumingii var. mairanensis|SN|15315]], better known as Weingartia mairanana, is a local or morphological form of the variable Rebutia neocumingii. It is a choice solitary plant with very dense, more numerous spines, winch are longer, finer and straw-coloured and profuse yellow to orange flowers. The flowers forms an irregular crown on the plant apex and have a hard time coming through the dense mass of spines. This cactus is indeed beautiful even without its blooms. Stem: Usually solitary, globose to short cylindrical up to 10 cm wide, 20 cm tall. Ribs: 16 to 18 tuberculate, often spiraling. Central spines: 2-8 up to 3 cm long. Radial spines: Up to 24 not easily distinguishable from crentrals, straw-yellow or yellowish with brown tips, up to 2 cm long. Flowers: Approx. 2 cm long, 2,5 cm in diameter, they are produced (unusually) all over the body of the plant expecially near the very tips of the stems differing from other rebutias in that its flowers appear very near the meristem as opposed to the lower, stem side and base locations of those others. As well, on this and a few other ex Weingartia species, one areole can produce up to 4 flowers. Blooming season: The flowers are produced in early summer and remain open for five or six days. Rebutia corroana Cárdenas: has hemispherical body with more woolly crown, fewer and stiffer spines, yellow flowers with green scales on the receptacle. Distribution: Bolivia (Cochabamba and Santa Cruz). Rebutia neocumingii (Backeb.) D.R.Hunt: (Subsp. neocumingii) it is quite variable as to its spines and subtle differences of tone in its yellow to orange flowers. Distribution: widespread in Bolivia and Peru. Rebutia neocumingii subs. lanata (F.Ritter) D.R.Hunt: has with very woolly apexes and areoles. It is very variable as to its spines and subtle differences of tone in its yellow to orange flowers. Distribution. Chuquisaca and Potosi, Bolivia. Rebutia neocumingii subs. pilcomayensis (Cárdenas) D.R.Hunt: has 12-15 radials and golden yellow flowers. Distribution: Potosi, Bolivia. Rebutia neocumingii subs. riograndensis (F.Ritter) D.R.Hunt: has few radials, usually only 5-10. Distribution: Santa Cruz, Bolivia. Rebutia neocumingii subs. saipinensis (F.H.Brandt) D.R.Hunt: has not less than 20 radials and golden yellow flowers. Distribution: Cochabamba, Bolivia. Rebutia neocumingii subs. trollii (Oeser) D.R.Hunt: This form is characterized by bright orange to orange-scarlet flowers. Distribution: Chuquisaca, Bolivia. Weingartia hediniana Backeb. : has somewhat fatter tubercles and many yellow flowers. Distribution: Chuquisaca and Potosi. Bolivia. Weingartia longigibba F.Ritter: has clustering bodies with large and prominent tubercles. It is similar to Weingartia riograndensis. Distribution: Bolivia, Department Chuquisaca, Province of Oropeza. Weingartia mairanana (Donald) F.H.Brandt: has very dense, more numerous spines, winch are longer, finer and straw-coloured. Distribution: Mairana, Florida, Santa Cruz, Bolivia. Weingartia neocumingii var. koehresii Oeser: has more numerous but shorter spines and yellow blooms. Distribution: Quillaquila, Oropeza, Chuquisaca, Bolivia. Weingartia neocumingii f. prolifera hort. : it is a monstrous highly branching variety that forms large clumps and blooms abundantly, just as a small specimen. Distribution: Known only in cultivation. Weingartia platygona Cárdenas: is very similar, if no the same as Weingartia pilcomayensis. Distribution: Millares, Potosi, Bolivia. Weingartia pruinosa hort. : has finer straw-coloured or brownish spines which are very dense and more numerous. Distribution: Oropeza, Chuquichuqui, Bolivia. Weingartia sp. KA381 Icla, altitude 2630m: has large tuberous root and the less numerous and larger tubercled ribs. Distribution: Icla, Chuquisaca, Bolivia. Cultivation and Propagation: In culture Rebutia neocumingii var. mairanensis|SN|15315]] is without problems, easy to grow, very attractive and regularly shows its beautiful flowers, if provided with an adequate winter rest period. Growth rate: It is a pretty slow grower. Repotting: It is better that they are repotted regularly. Repotting will increase size of stems and the number of flowers produced. Repot yearly until reaching about 100 mm in size, then every two or three years will suffice. Repotting is best done at the end of winter but can be done at other times. Do not water for a couple of weeks after repotting to reduce risk of root rot via broken roots. Moisture: It is sensitive to over-watering (rot prone), and needs good drainage. In the winter keep it cool, and absolutely dry conditions. In summer keep it well watered when it's hot. They are really not very demanding and regular watering in their growing season creates healthy disease resistant plants that will flower better. Special need: Provide very good ventilation. Nearly all problems occur as a result of overwatering and poor ventilation, especially when weather conditions are dull and cool or very humid. Fertilization: Light fertilizer seems to boost its growth whenever additional water is given. Feed it during the growing season with a fertilizer specifically formulated for cactus and succulents (high potash fertilizer with a dilute low nitrogen), including all micro nutrients and trace elements diluted to ½ the strength recommended on the label. It thrive in poor soils and needs a limited supplies of fertilizer to avoid the plant developing excess vegetation, which is easily attacked by fungal diseases. Exposure: Needs full sun. To achieve the best spine density give these plants lots of sun. Hardiness: Keep dry or slightly moist in winter at a minimum temperature of 5°C (But Hardy to -4°C or less). In mild climate they grow well when planted freely outside in well-drained soil. Pest and diseases: Occasionally these plants are infested by mites and mealy-bugs, but all known garden pests can be kept to a minimum by simply ensuring optimal growing conditions and healthy plants. Use: It can be cultivated outdoors in raised beds and terraces. It do well in pots as well. Propagation: Seeds. The seeds can be sown in pots of fine, well-drained sandy soil, any time during the spring when temperatures are warm. Cover the seeds with a fine layer of grit and water from below with a fungicide to prevent damping off. For the 1-2 weeks cover the pots with a sheet of glass/clear perspex to keep the humidity levels high. Remove the glass and replace it with light shade-cloth and mist once or twice a day for the next two weeks after which most seeds should have germinated. From then on mistings can be reduced to every second and then every third day as the little plants grow. The seedlings should not be disturbed until they are well rooted after which they can be planted separately in small pots.